If that bird happens to be a Jersey chough, substitute “earth” for Les Landes and “successive autumns” for lots and lots of insects. For the first time since the choughs have been living at liberty, the entire flock have snubbed their morning supplemental feed in favour of wild pickings out at Les Landes. 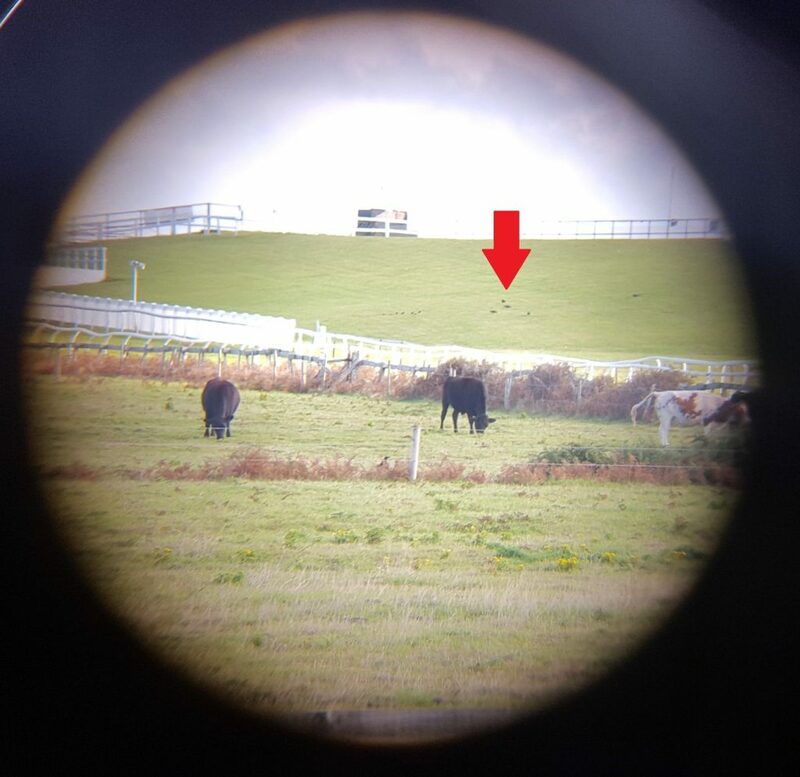 Chough spotting in the middle of Les Landes Racecourse (the red circles indicate choughs, not cowpats). Photo by Liz Corry. 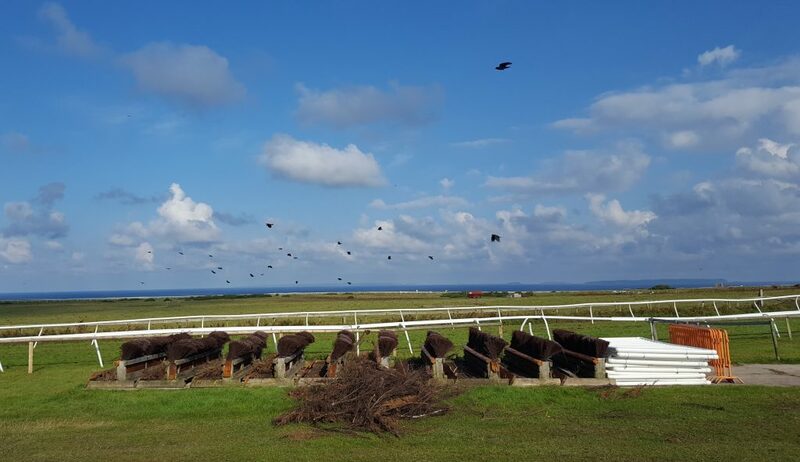 Choughs taking flight at Les Landes Racecourse. Photo by Liz Corry. They have been flipping over and picking apart cow pats, probing the grass on the spectators’ stand at the Racecourse for cranefly larvae, and scouring the cliff face for anything else they can prise out of the ground. A group of choughs (under the arrow) and starlings foraging in the spectators’ area of the Racecourse. Photo by Liz Corry. This is obviously encouraging news for the project. 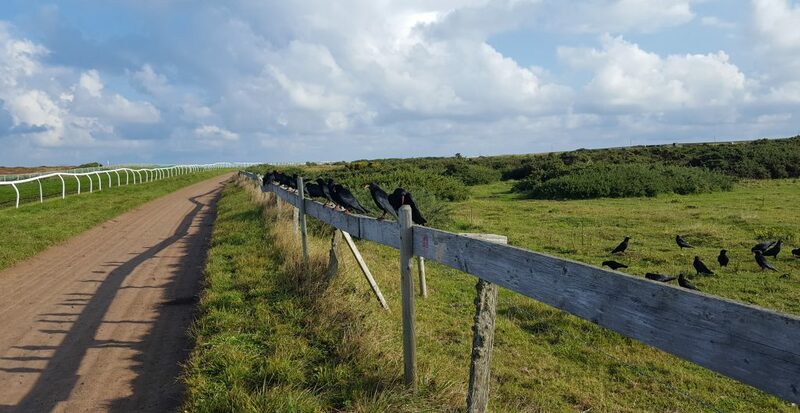 The choughs are clearly content and they are gaining popularity with the public, both locals and tourists who delight in watching their antics. Especially the flying displays. For the lone observer tasked with keeping track of all 38 choughs it is a roller coaster of emotions; pride, joy, irritation, despair etc. The blessed things don’t stay still nor in one group and it is near impossible to read leg rings. Add to that the inevitable sod’s law factor and you get events such as (1) Racecourse tractor mowing back and forth along your observation site (2) friendly kestrel spotting lunch slap bang in the middle of the foraging chough flock sending them scattering just as you are half way through counting said flock and (3) random 10 minute hail storm! 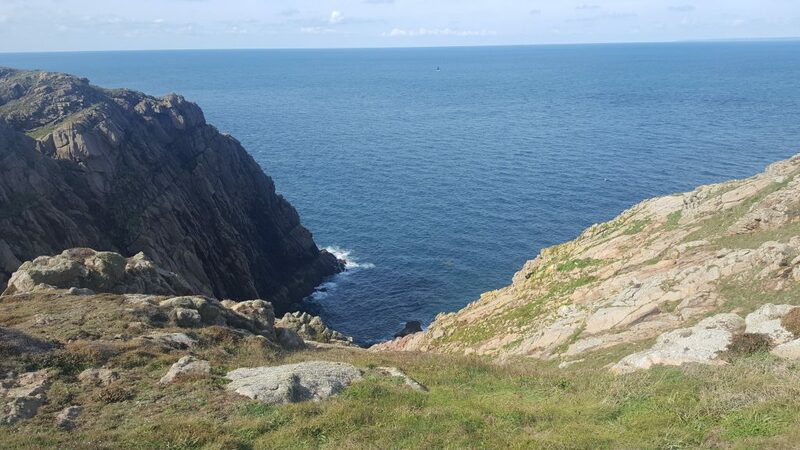 La Nethe Falaise is a favourite spot for the choughs to hang out when they are up at Grosnez. Photo by Liz Corry. There is, however, one trick of the trade that can be deployed and moments of need. It should only be practised by a trained professional. 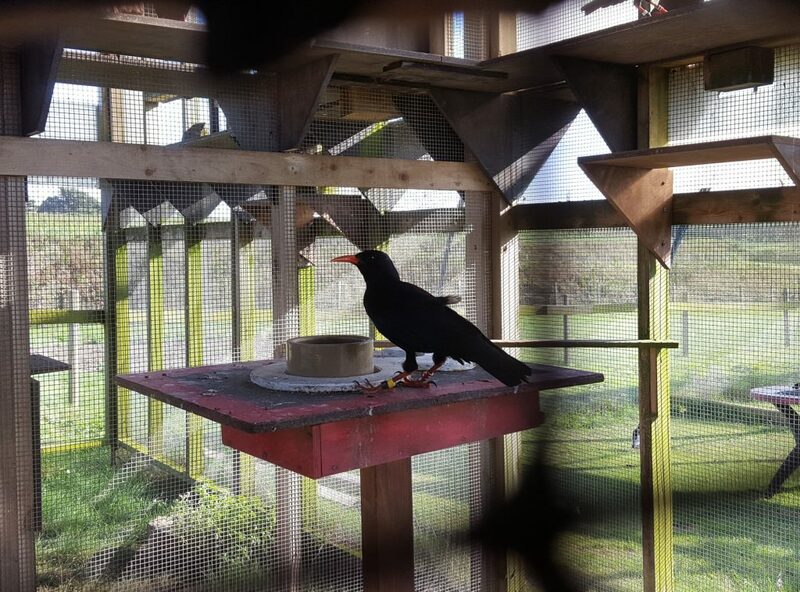 It can only be practised by a trained professional since without the recognition from the foster-reared and hand-reared choughs it probably wouldn’t work and you would be left looking like a right Parus major (one for the bird geeks). Like any species, the offer of free food is too tempting and providing I can get close enough in an area where the birds do not feel threatened I can get the choughs to gather together in one place. 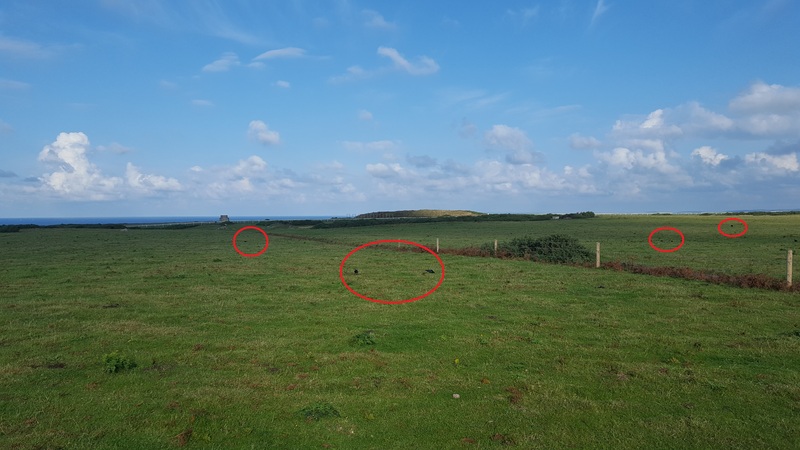 Note in the video and photos the choughs closest to me are Ubè and Vicq, both foster-reared, and a couple of the older adults who have known me for four years. Thirty of the choughs getting a sneaky supplemental feed at Les Landes Racecourse. Photo by Liz Corry. It is possible to identify most of the leg rings when the choughs are this close. Right up until the point when sod’s law example number 2 comes into play. After that, only the clingy types stay behind begging for more free food. For the past few weeks the maximum number of choughs at any one time has been thirty-four. There should be thirty-eight. The individuals who appear to be absent most often are Lee and Caûvette, their chick Pink, and Carmine another wild chick hatched this year. Carmine, a wild chick from this year, was last seen at the aviary on September 2nd. Photo by Liz Corry. Whilst it would be nice to assume Pink is with her parents, both chicks are of an age now not to be dependent on their parents. Furthermore they were both showing signs of having nematodes back in August. Failed attempts to catch them up in the aviary meant that they were never treated before they were last seen at Sorel at the start of September. It is quite possible that Carmine and Pink have sadly perished. Ever optimistic we will continue monitoring the population and ask the public to keep their eyes (and ears) open. As a footnote, apologies for the media quality this month. The trusty camera has packed up and I am relying on my camera phone! Wonderful sight, I was walking the dogs and saw the lot!